Hobnobbing with Hollywood types was about the last thing one could have expected when Szabo was born January 4, 1906, in Kosice, then part of Hungary. The city was overrun in World War I` and became part of Czechoslovakia. His parents spirited their seven children to Budapest and Szabo later learned to box and wrestle in return for bread during lean war-torn years. He was a top-flight Greco-Roman wrestler, winning a bronze medal at 82 kilograms (about 180 pounds) at the European championships in 1926 and a gold medal a year later. Szabo came to the United States as a member of the 1929 Hungarian Greco-Roman national team and saw enough to make it his permanent home. 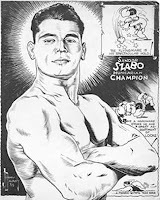 Szabo debuted as a pro in October of 1930 and promoters pushed him to the moon as a hunk of a man with legitimate wrestling credentials and also an appeal to ethnics. 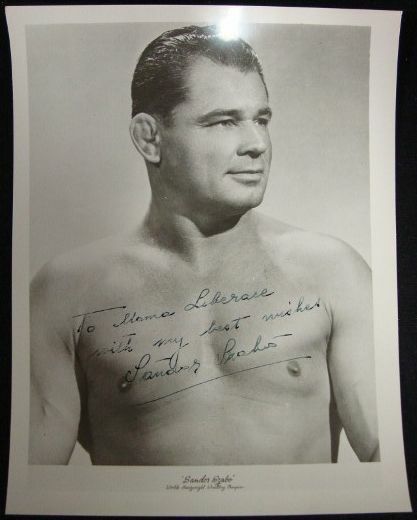 Szabo stayed mostly on the East Coast and in Canada, wrestling the likes of Jim Londos and Ed “Strangler” Lewis until 1935, when he took his first trip west. He brought wife Lillian and made Santa Monica, California, his base of operations for the rest of his life. 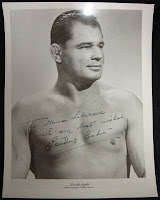 His name was synonymous with the Pacific Coast title, which he held 13 times from 1937 to 1951. In June 1941, Szabo won the first of his world championships, beating Bronko Nagurski by DQ for the National Wrestling Association belt in St. Louis as an eleventh-hour replacement for Ruffy Silverstein. 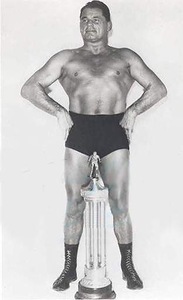 He’d eventually achieve an unparalleled grand slam as the only wrestler to hold the National Wrestling Association title, the Boston-based American Wrestling Association world title, the Montreal version of the title, and the Minneapolis version of the NWA title. When Hungarian dissidents rose up against Soviet bloc control in 1956, Szabo, who became an American citizen in August 1938, helped many of them escape persecution and enter the United States. His sponsorship of some of the estimated 200,000 refugees who fled Hungary earned him a letter of commendation from President Dwight Eisenhower. As the 1950s rolled on, Szabo lived a comfortable life on the West Coast, pulling in about $50,000 annually, by his estimate, through wrestling, bit parts in TV shows and movies, singing gigs, and real estate investments. 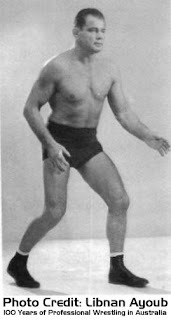 He opened a wrestling school for youths and would-be pros in Westwood, California—Cowboy Bob Ellis was among his trainees—and was assistant booker to Jules Strongbow for the Los Angeles territory. Szabo would wrestle, off and on, until 1963. On October 13, 1966, he suffered a fatal heart attack at his home. SzaboServices. Awesome Inc. theme. Powered by Blogger.